I’ve written about the Garvellachs before on The Hazel Tree; quite simply, it is a place like no other. In the 5th century these beautiful, wild islands were inhabited by Christian missionaries from Ireland who set up beehive cells there, and lived life on the edge – the edge of paradise, and the edge of civilisation. Most of the remains on Eileach an Naoimh, ‘the isle of the saints’, are immediately visible, even though the landscape is trying to reclaim them, but one intriguing structure is not. 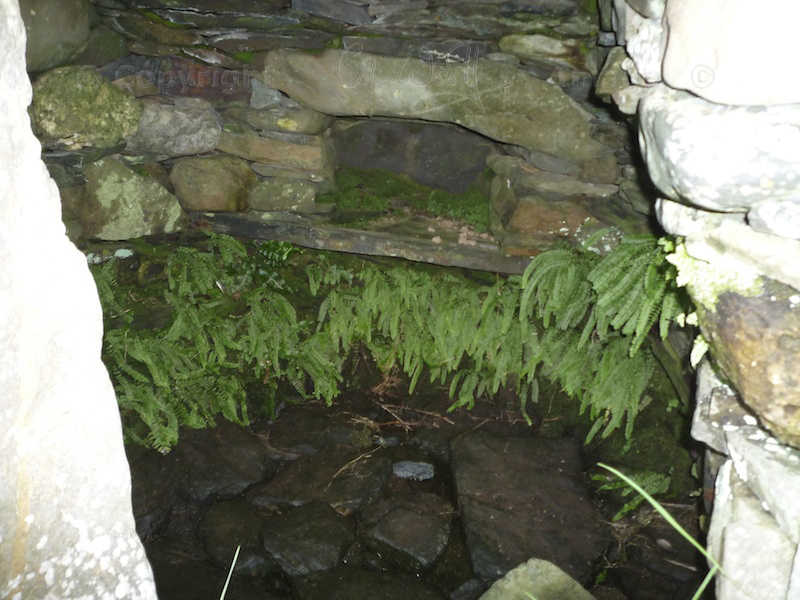 This is an underground chamber or souterrain, and it is set into a flat area of beautifully lush grass just in front of the medieval chapel. I am quite fascinated by underground chambers, even though they give me the heeby-geebies once I’m in there. The good thing about this one is that you don’t need to crawl inside to appreciate it. 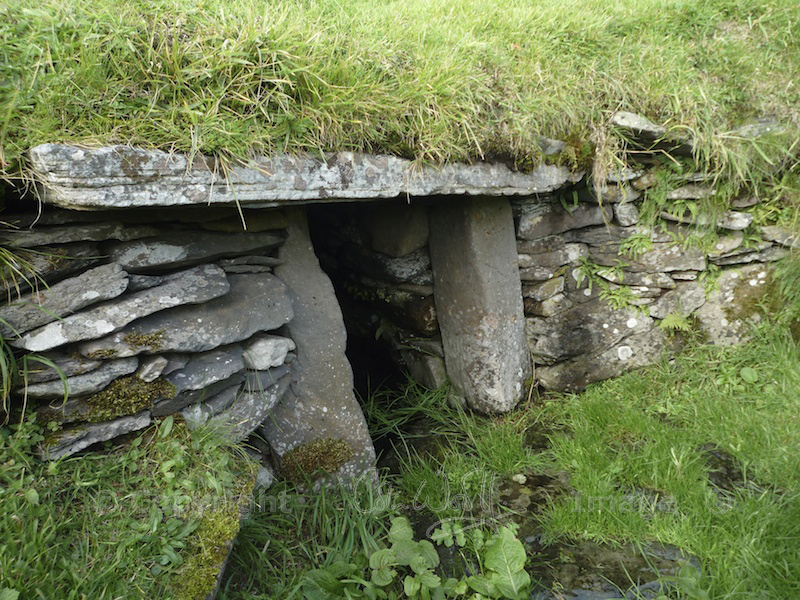 There is a roofless outer chamber – now little more than a hollow in the ground – with steps set into the side. A large flat lintel covers the entrance to an inner chamber. Inside, the roughly dome-shaped ‘room’ is just under six feet high by about four and a half feet across. The floor and walls are roughly paved with stones, and all the surfaces are moist with water. Inset into the far wall is an ‘aumbry’ or recess, with its own little lintel and sill. Immediately, you wonder what this cubby hole was used for. Keeping things cool, perhaps? Butter, milk, meat? Maybe it was a kind of shrine for precious relics? Penitential? Don’t tell me that someone was walled up here, because I’m not going to think about that. But I know from reading elsewhere that monks of this period would take themselves off into a kind of self-imposed solitary confinement, to be alone and silent for long periods of meditation. This reminds me that I have read somewhere about the different forms of penance undertaken by early Irish missionaries: the voluntary abandonment of your family and homeland was known as ‘white martyrdom’, as opposed to red martyrdom which involved the shedding of blood. So… was this a larder, or a sanctuary, or a cell? I’m inclined to think it was a sanctuary for solitary prayer, although I have nothing to go on except instinct. 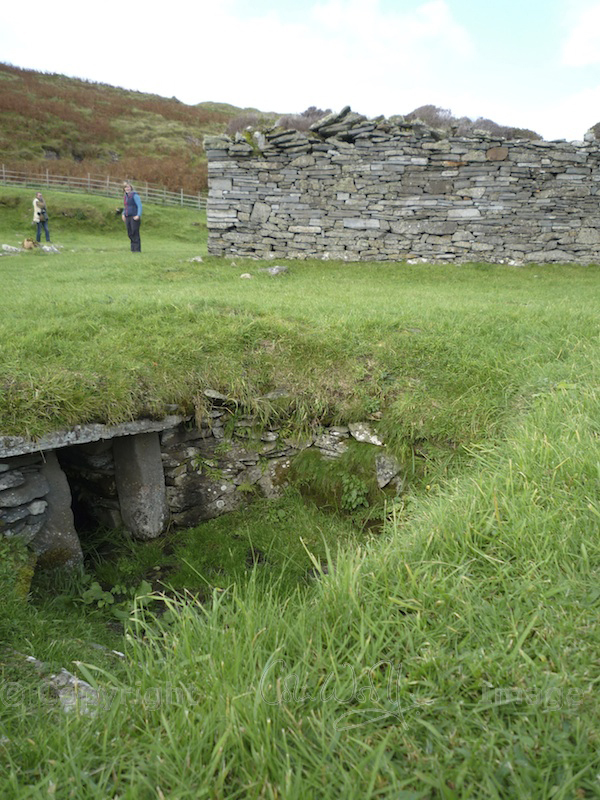 The RCAHMS doesn’t give a definite date for the construction of the chamber, but from their general descriptions I imagine that it was built around the same time as the first monastic structures on the island, in other words in the 5th or 6th century. 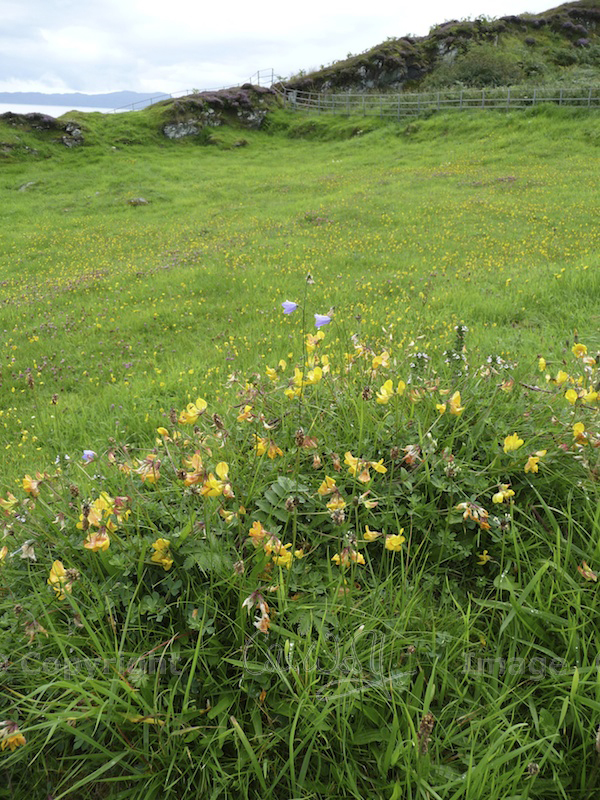 Just a few steps away is the old graveyard, in spring and summer a mass of wild flowers, where a few weather-worn upright slabs mark the last resting places of unnamed people – saints, monks, seafarers, settlers. It’s intensely peaceful, and you can feel your thoughts relaxing as you tune into a gentler pulse. Fascinating! We’re there not similar settlements (religious) on the little isles in the middle of Loch Lomond not much later? Thank you! 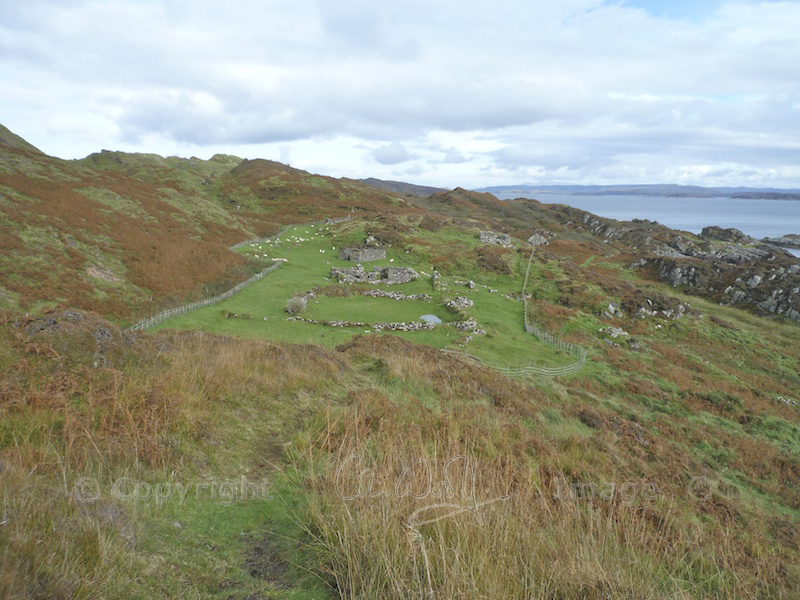 As for the Loch Lomond islands, I’m not sure but I’m trying to find out… the RCAHMS mentions that there was a ruined chapel on Inchmurrin at one time that was “built before the 14th century” but the ruins have been lost and now it is just an enclosure. There is also a burial ground, of undefined date. Do you remember which islands in particular on Loch Lomond you had heard this about? I’m delighted to see more of the Garvellachs, it looks such a tranquil and beautiful place. I expect you could do quite a bit of serious meditation in that little underground chamber, and it’s nice to think that your chums would be on hand to make sure you didn’t overdo it. Not a bad spot to have your remains buried in either, I like the idea of being left somewhere so peaceful. It’s certainly a peaceful, wonderful place, Lorna! The atmosphere is really serene. As for the meditation, I think I’d prefer to do this in the fresh air, but in a howling gale I’m sure that little chamber was quite inviting! A wonderful piece on archaeology, history and speleology!. I love caves and dwelling into the past trying to figure out how locals lived, The site seems so peaceful for a stroll at your own pace. The view from afar is fantastic. The wildflowers are lovely. To complete the “tour”, I read your related article. Thank you for taking us to these incredible places!. Thank you, Carmen! I’m very glad you enjoyed this trip to the Garvellachs! It really is such a special, peaceful place, with beautiful sea views in every direction. I would so like to go back in time and see it when the monks had just settled there. You would just love them, Lynne! The first time we visited, we went on a boat trip with Seafari out of Easdale, south of Oban. The second time, we sailed there with Leonie & Andrew. It’s just magical! Thank you, Marialla! You’re right, there is so much that we can learn. I’m really fascinated by the people of this time, i.e. the early medieval period – I would so like to go back in time. Thanks again – I’m really glad you enjoyed it! It really is so difficult to imagine what life was like for the people who used these, but what a powerful statement of their faith. So glad to have found your slice of Blogland! That’s very true, Anny. Thank you for your comment, and I’m glad to have found your blog, too! Always good to meet someone as mad about castles as I am! How interesting this is. You always present history in such an entertaining way…I never want the words to end. Thank you so much! 🙂 That’s a lovely compliment. I’m really glad you enjoyed it – and I know you would love this place. I always want to go there again when I write about it! Such fascinating historical sites in Scotland! Thanks, Jo!